¡Ay, caramba! Cinco de Mayo falls on a Tuesday this year, but if you think that will stop the city from having a fiesta, think again. Prepare to be a weekday warrior and celebrate the holiday in all its queso- and margarita-fueled glory, no borders crossed. Before bringing its south-of-the-border cuisine to locations nationwide, Rosa Mexicano (various locations) first opened in Midtown Manhattan in 1984, earning a prime reputation for the high-style of its fare. Tacos are served in cast iron skillets, guacamole is prepared tableside, and now, even a gluten-free menu has made its way into the mix. The atmosphere is festive without being rowdy, and—as its name denotes—décor accents are as pink as the pomegranate margaritas. For a more formal, quieter meal, El Toro Blanco (6th Ave. nr. Bedford St.) gives a liberally upscale spin to classic Mexican dishes, served to diners lounging on bright-orange banquettes in the midcentury modern space. Guacamole comes in a three-part tasting dish, fish tacos offer options of swordfish and charred octopus, even Maine lobster features on the menu, though it’s happily dressed down with fragrant Mexican street corn. A consensual favorite part of every Mexican meal is the libations, and especially those carrying a name as lovely to say as to sip: margaritas. Arriba Arriba (9th Ave. at 51st St.) makes notoriously good ones, though no one quite knows their secret. Perhaps it is their size selection, ranging from the four-ounce “El Bebe” to the 27-oz “La Mama,” or the juicy tropical flavors like blood orange and passion fruit. Meanwhile, Pampano (49th St. nr. Lexington Ave.)—an award-winning, fine dining Mexican restaurant operated in part by famed opera tenor Placido Domingo – turns margaritas into a culinary experience. Best sipped in the outdoor dining area, the drink is made complex with ingredients such as hibiscus, tamarind, and tequila infused with jalapenos. Think of them as a new way to achieve creative consciousness. For something decidedly on-trend, the brand new Tequila Park (58th St. nr. 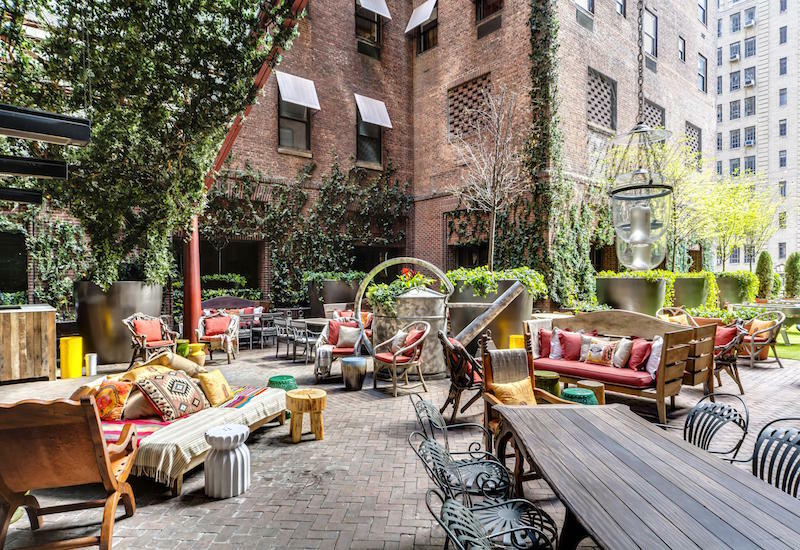 Ninth Ave.) opens this May in the Private Park of the Philippe Starck–designed Hudson Hotel. A courtyard lounge with a bohemian-chic vibe, the Park is sure to be the perfect spot to grab dinner at its taco shack and chill out with a fresh-juice margarita or Mexican beer. Music performances on select nights only help the cause. Tequila tastings may sound like another phrase for “shots!” given the liquor’s reputation as a party drink. But when the finer bottles of tequila are brought out and poured in carefully chosen arrangements, the experience can be on-par with a sampling Scotch or Brandy. In the West Village, the chic, white-tablecloth Agave (7th Ave. nr. Charles St.) houses a library-like collection of Mexican spirits about which servers are happy to introduce and educate newcomers. Lists of every category of the alcohol are index-like, from blancos (tequila aged two months or less) all the way up to extra-añejos (a minimum of three years), not to mention the mescals, sotols, and specialty agave spirits. It can all be quite a bit to navigate, but the tequila flight selections, which come in pre-picked sets of three, are a good place to start. Tucked beneath the Hotel on Rivington in the Lower East Side, Viktor & Spoils (Rivington St. nr. Essex) offers a similarly comprehensive selection but in a less sit-and-dine setting. The best approach here may be to saunter up to a bartender, give a run-down of the flavors you’re after—sweet or sour? smoky or smooth?—and let him or her pick from the wall of bottles. Given its location, young crowds tend to pack in for the cocktails made with Mexican sodas on late nights and weekends, but the rustic, candle-lit subterranean watering hole derives some of its sophistication in being slightly unkempt. Some stomach-lining substance is never a bad idea to pair with tequila; go for the churros and dipping sauces.